A silver quadrumer consisting of four parallel aligned rectangular nanobars, with three at the bottom and one at the top, is proposed to provide two Fano resonances. These two resonances can be adjusted either simultaneously or independently simply by tuning the geometrical parameters. Due to the formation of the two resonances in a relatively short wavelength range, one of them can be spectrally squeezed to be very narrow, which induces a very high figure of merit (FoM=45). By decomposing the scattering spectrum into bright modes and dark modes, the double Fano resonances are found to be originated from grouping the unit cells into two different groups. The evolution of the scattering spectrum with the central dimer position along the polarization direction suggests that the symmetry reducing induces the second Fano resonance and improves the FoM of the first one. By introducing one more nanobar into the quadrumer system, the FoM can approach the material’s limit, although the dip is relatively shallow. The ultrahigh FoM of the Fano resonance in the proposed quadrumer can provide ultra-sensitive refractive index sensing. Furthermore, the method for providing multiple independently tunable Fano resonances can offer new solutions to designing plasmonic-related nanolasers, photocatalysis, and biochemical sensors, etc. 9 March 2018: A typographical correction was made to the author affiliations. C. Wu, A. B. Khanikaev, R. Adato, N. Arju, A. A. Yanik, H. Altug, and G. Shvets, “Fano-resonant asymmetric metamaterials for ultrasensitive spectroscopy and identification of molecular monolayers,” Nat. Mater. 11, 69–75 (2012). Z. L. Deng, N. Yogesh, X. D. Chen, W. J. Chen, J. W. Dong, Z. B. Ouyang, and G. P. Wang, “Full controlling of Fano resonances in metal-slit superlattice,” Sci. Rep. 5, 18461 (2015). A. N. Poddubny, M. V. Rybin, M. F. Limonov, and Y. S. Kivshar, “Fano interference governs wave transport in disordered systems,” Nat. Commun. 3, 914 (2012). J. A. Fan, K. Bao, C. Wu, J. Bao, R. Bardhan, N. J. Halas, V. N. Manoharan, G. Shvets, P. Nordler, and F. Capasso, “Fano-like interference in self-assembled plasmonic quadrumer clusters,” Nano Lett. 10, 4680–4685 (2010). H. X. Xu, E. J. Bjerneld, M. Käll, and L. Borjesson, “Spectroscopy of single hemoglobin molecules by surface enhanced Raman scattering,” Phys. Rev. Lett. 83, 4357–4360 (1999). P. Mühlschlegel, H. J. Eisler, O. J. F. Martin, B. Hecht, and D. W. Pohl, “Resonant optical antennas,” Science 308, 1607–1609 (2005). J. N. Anker, W. P. Hall, O. Lyres, N. C. Shah, J. Zhao, and R. P. Van Duyne, “Biosensing with plasmonic nanosensors,” Nat. Mater. 7, 442–453 (2008). K. M. Mayer and J. H. Hafner, “Localized surface plasmon resonance sensors,” Chem. Rev. 111, 3828–3857 (2011). Y. Shen, J. Zhou, T. Liu, Y. Tao, R. Jiang, M. Liu, G. Xiao, J. Zhu, Z.-K. Zhou, X. Wang, C. Jin, and J. Wang, “Plasmonic gold mushroom arrays with refractive index sensing figures of merit approaching the theoretical limit,” Nat. Commun. 4, 2381 (2013). S. Mukherjee, F. Libisch, N. Large, O. Neumann, L. V. Brown, J. Cheng, J. B. Lassiter, E. A. Carter, P. Nordlander, and N. J. Halas, “Hot electrons do the impossible: plasmon-induced dissociation of H2 on Au,” Nano Lett. 13, 240–247 (2013). S. Biswas, J. Duan, D. Nepal, K. Park, R. Pachter, and R. A. Vaia, “Plasmonic resonances in self-assembled reduced symmetry gold nanorod structures,” Nano Lett. 13, 6287–6291 (2013). A. Ahmadiv, M. Karabiyik, and N. Pala, “Intensifying magnetic dark modes in the antisymmetric plasmonic quadrumer composed of AL/Al2O3 nanodisks with the placement of silicon nanospheres,” Opt. Commun. 338, 218–225 (2015). F. Hao, P. Nordlander, Y. Sonnefraud, P. V. Dorpe, and S. A. Maier, “Tunability of subradiant dipolar and Fano-type plasmon resonances in metallic ring/disk cavities: implications for nanoscale optical sensing,” ACS Nano 3, 643–652 (2009). F. Neubrech, A. Pucci, T. Walter Cornelius, S. Karim, A. Garcia-Etxarri, and J. Aizpurua, “Resonant plasmonic and vibrational coupling in a tailored nanoantenna for infrared detection,” Phys. Rev. Lett. 101, 157403 (2008). H. Aouani, H. Šípová, M. Rahmani, M. Navarro-Cia, K. Hegnerová, J. Homola, M. Hong, and S. A. Maier, “Ultrasensitive broadband probing of molecular vibrational modes with multifrequency optical antennas,” ACS Nano 7, 669–675 (2012). J. A. Fan, Y. He, K. Bao, C. Wu, J. Bao, N. B. Schade, V. N. Manoharan, G. Shvets, P. Nordler, D. R. Liu, and F. Capasso, “DNA-enabled self-assembly of plasmonic nanoclusters,” Nano Lett. 11, 4859–4864 (2011). F. Wang and Y. R. Shen, “General properties of local plasmons in metal nanostructures,” Phys. Rev. Lett. 97, 206806 (2006). L. V. Brown, H. Sobhani, J. B. Lassiter, P. Nordlander, and N. J. Halas, “Heterodimers: plasmonic properties of mismatched nanoparticle pairs,” ACS Nano 4, 819–832 (2010). Z. J. Yang, Z. S. Zhang, W. Zhang, Z. H. Hao, and Q. Q. Wang, “Twinned Fano interferences induced by hybridized plasmons in Au-Ag nanorod heterodimers,” Appl. Phys. Lett. 96, 13113 (2010). A. Lovera, B. Gallinet, P. Nordlander, and O. J. F. Martin, “Mechanisms of Fano resonances in coupled plasmonic systems,” ACS Nano 7, 4527–4536 (2013). F. Hao, Y. Sonnefraud, P. V. Dorpe, S. A. Maier, N. J. Halas, and P. Nordler, “Symmetry breaking in plasmonic nanocavities: subradiant LSPR sensing and a tunable Fano resonance,” Nano Lett. 8, 3983–3988 (2008). S. P. Zhang and H. X. Xu, “Tunable dark plasmons in a metallic nanocube dimer toward ultimate sensitivity nanoplasmonic sensors,” Nanoscale 8, 13722–13729 (2016). J. Chen, Q. Shen, Z. Chen, Q. Wang, C. Tang, and Z. Wang, “Multiple Fano resonances in monolayer hexagonal non-close-packed metallic shells,” J. Chem. Phys. 136, 214703 (2012). D. Dregely, M. Hentschel, and H. Giessen, “Excitation and tuning of higher-order Fano resonances in plasmonic oligomer clusters,” ACS Nano 5, 8202–8211 (2011). 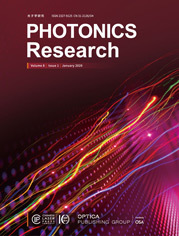 Y. Cui, J. Zhou, V. A. Tamma, and W. Park, “Dynamic tuning and symmetry lowering of Fano resonance in plasmonic nanostructure,” ACS Nano 6, 2385–2393 (2012). S. D. Liu, Z. Yang, R. P. Liu, and X. Y. Li, “Multiple Fano resonances in plasmonic heptamer clusters composed of split nanorings,” ACS Nano 6, 6260–6271 (2012). S. D. Liu, Y. B. Yang, Z. H. Chen, W. J. Wang, H. M. Fei, M. J. Zhang, and Y. C. Wang, “Excitation of multiple Fano resonances in plasmonic clusters with D2h point group symmetry,” J. Phys. Chem. C 117, 14218–14228 (2013). Y. Wang, Z. Li, K. Zhao, A. Sobhani, X. Zhu, Z. Fang, and N. J. Halas, “Substrate-mediated charge transfer plasmons in simple and complex nanoparticle clusters,” Nanoscale 5, 9897–9901 (2013). Z. J. Yang, Q. Q. Wang, and H. Q. Lin, “Tunable two types of Fano resonances in metal-dielectric core-shell nanoparticle clusters,” Appl. Phys. Lett. 103, 111115 (2013). J. Zhang and A. Zayats, “Multiple Fano resonances in single-layer nonconcentric core-shell nanostructures,” Opt. Express 21, 8426–8436 (2013). J. Wang, C. Fan, J. He, P. Ding, E. Liang, and Q. Xue, “Double Fano resonances due to interplay of electric and magnetic plasmon modes in planar plasmonic structure with high sensing sensitivity,” Opt. Express 21, 2236–2244 (2013). Y. Zhang, T. Q. Jia, H. M. Zhang, and Z. Z. Xu, “Fano resonances in disk-ring plasmonic nanostructure: strong interaction between bright dipolar and dark multipolar mode,” Opt. Lett. 37, 4919–4921 (2012). A. D. Khan, S. D. Khan, R. U. Khan, and N. Ahmad, “Excitation of multiple Fano-like resonances induced by higher order plasmon modes in three-layered bimetallic nanoshell dimer,” Plasmonics 9, 461–475 (2014). L. Y. Yin, Y. H. Huang, X. Wang, S. T. Ning, and S. D. Liu, “Double Fano resonances in nanoring cavity dimers: the effect of plasmon hybridization between dark subradiant modes,” AIP Adv. 4, 077113 (2014). N. Liu, M. Hentschel, T. Weiss, A. P. Alivisatos, and H. Giessen, “Three-dimensional plasmon rulers,” Science 332, 1407–1410 (2011). Y. H. Fu, J. B. Zhang, Y. F. Yu, and B. Luk’yanchuk, “Generating and manipulating higher order Fano resonances in dual-disk ring plasmonic nanostructures,” ACS Nano 6, 5130–5137 (2012). M. Hentschel, D. Dregely, R. Vogelgesang, H. Giessen, and N. Liu, “Plasmonic oligomers: the role of individual particles in collective behavior,” ACS Nano 5, 2042–2050 (2011). C. Wu, A. B. Khanikaev, and G. Shvets, “Broadband slow light metamaterial based on a double-continuum Fano resonance,” Phys. Rev. Lett. 106, 107403 (2011). G. Z. Li, Q. Li, L. Xu, and L. J. Wu, “Double Fano resonances in plasmonic nanocross molecules and magnetic plasmon propagation,” Nanoscale 7, 19914–19920 (2015). P. B. Johnson and R. W. Christy, “Optical-constants of noble-metals,” Phys. Rev. B 6, 4370–4379 (1972). S. Fan, W. Suh, and J. D. Joannopoulos, “Temporal coupled-mode theory for the Fano resonance in optical resonators,” J. Opt. Soc. Am. A 20, 569–572 (2003). Z. Ruan and S. Fan, “Temporal coupled-mode theory for Fano resonance in light scattering by a single obstacle,” J. Phys. Chem. C 114, 7324–7329 (2010). Y. H. Zhan, D. Y. Lei, X. F. Li, and S. A. Maier, “Plasmonic Fano resonances in nanohole quadrumers for ultra-sensitive refractive index sensing,” Nanoscale 6, 4705–4715 (2014). G. Z. Li, Q. Li, L. Xu, and L. J. Wu, “Numerical realization of Fano-type resonances in cascaded plasmonic heterodimers for refractive index sensing,” Plasmonics 10, 1401–1407 (2015). J. A. Fan, C. Wu, K. Bao, J. Bao, R. Bardhan, N. Halas, V. Manoharan, P. Nordlander, G. Shvets, and F. Capasso, “Self-assembled plasmonic nanoparticle clusters,” Science 328, 1135–1138 (2010). Fig. 1. (a) Schematic of the proposed quadrumer system. Geometrical parameters are fixed as (unless otherwise specified) D = 30 nm , S = 30 nm , thickness T = 16 nm , L = 100 nm , and W = 40 nm . (b) The corresponding numerically obtained scattering spectrum of the system (blue open circles) can be decomposed into two bright modes (gray and purple dashed lines) and two asymmetric Fano modes (cyan and red dashed lines). The green solid line is calculated by the analytical equation (A1) from the Appendix A. (c) Surface charge (top panel) and electric field (bottom panel) distributions at different wavelengths. The color of the frame and the mark spots in (b) are consistent. Fig. 2. Simulated scattering spectra for the Q1 system (blue open circles), the bottom trimer (Bar1+Bar2+Bar3, gray solid line), and the middle dimer (Bar2+Bar4, cyan solid line). The decomposed two bright modes are also shown (gray and purple dashed lines) together for comparison. Fig. 3. (a) Evolution of the scattering spectra of Q1 at normal incidence with different polarization angles, where the 0° (90°) corresponds to the positive y ( x ) direction. (b) The charge distribution of Q1 at FR1 (834 nm) for polarizations at 0°, 10°, 50°, and 90°, respectively. Fig. 4. Scattering spectra of Q1 with (a) D varied from 30 nm to 60 nm, (b) S varied from 30 nm to 60 nm, (c) M varied from 65 nm to 130 nm, and (d) T varied from 16 nm to 40 nm. For M = 0 , please refer to the following Fig. 9(b). Fig. 5. Scattering spectra of the (a) Q1, (b) Q2, and (c) pentamer systems as a function of the refractive index of the surrounding medium. Fig. 6. FoMs of FR1 for the Q1, Q2, and pentamer systems, which are calculated based on the scattering spectra shown in Figs. 5(a)–5(c). Please note that not all the scattering spectra are shown there. The black solid line represents the theoretical value obtained by the Eq. (1). Fig. 7. (a) Schematic of the quadrumer 2 (Q2) system. Geometrical parameters are chosen as the same as those in Fig. 1(a). (b) The corresponding numerically obtained scattering spectrum of the system (blue open circles) can be decomposed into a bright mode (gray dashed line) and an asymmetric Fano mode (cyan dashed line). The green solid line represents the analysis data calculated by the Eq. (A1) in Appendix A. Fig. 8. (a) Simulated scattering spectrum of the Q2 system (blue open circles) can be decomposed into one bright mode (gray dashed line) and one asymmetric Fano mode (red dashed line). The cyan solid line plots the simulated scattering spectrum from the middle dimer, while the green solid line indicates the analyzed data. (b) Corresponding surface charge (top panel) and electric field (bottom panel) distributions at different wavelengths. Fig. 9. (a) Evolution of the simulated scattering spectra of the quadrumer by pushing the two central nanobars along the x direction. M defines the pushing distance away from the symmetric center along the x direction. (b) Calculated distribution of surface charges with M = 0 , 16, and 48 nm, respectively. The top panel framed by dashed lines corresponds to the shorter wavelength dip, while the bottom panel corresponds to the longer one. FR2 disappears when M = 0 nm . Fig. 10. (a) Schematic of the pentamer. The unit cells are the same as those in Q1. D 1 = D 2 = 30 nm . (b) The corresponding simulated scattering spectrum can also be decomposed into two bright modes and two asymmetric Fano modes. The color and line styles are consistent with those in Fig. 1(b). (c) Calculated surface charge and electric field distributions of the pentamer at FR1 and FR2, respectively. Fig. 11. Simulated scattering spectra for the pentamer system (blue open circles), the bottom trimer (green solid line), and the top dimer combined with the bottom central nanobar (cyan solid line). The decomposed two bright modes are also shown (gray and purple dashed lines) together for comparison. Fig. 12. Simulated scattering spectra for the pentamer system in which the blue (green) solid line represents D 2 = 30 nm (20 nm). Other geometric parameters are the same as in Figs. 1 and 10.